A real time warp - it's no cheapie, but dangerously close to the original and just as valid today as it ever was. Build quality, looks and those trademark tones. Attention to period detail. 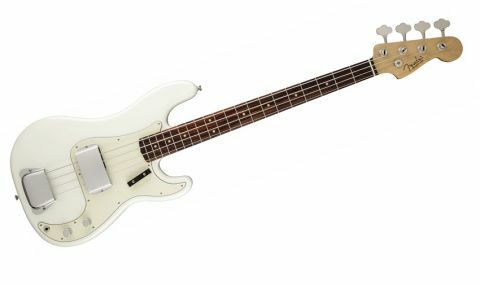 Although the original Precision bass was a fantastic design in itself, it took a few trips back to the drawing board before Fender finally made it into the classic instrument it is today. By the third design revision of the 1950s it was pretty much there, but in the latter months before the CBS buyout, the Fullerton firm refined it even further by adding a round-laminated rosewood fingerboard. This bass reflects those final months of tinkering, with characteristically contoured ash body, maple neck with a C-profile and a slightly more generous width, plus the aforementioned rosewood fingerboard. The vintage-style bridge features threaded steel saddles and surface stringing, while the shamrock tuners have the authentic reverse action. It's available in Olympic White, Frost Red, Faded Sonic Blue and the classic Three-colour Sunburst but the price stays consistent for all colours, and includes a fully fitted Fender hard case. "The Precision sound remains one of the most well known in music"
The Precision sound remains one of the most well known in music, as it has appeared on so many recordings over the years; it has become the benchmark for all other bass sounds to follow. With just volume and tone controls, it has the simplest of circuits but it does benefit from the new American Vintage '63 split-coil pickup as developed by Leo Fender back in the 50s. This pickup is all about being able to balance the output evenly from each string and the minimalist circuitry allows the true sound of the bass to be reproduced. For those of you yet to experience a Precision, it possesses a generally warm, full tone but with clearly defined notes whether you operate at one tonal extreme or the other. With all the tone rolled back it gets full and fruity but never muffled, while at the other end the top is edgy and full of bite but never thin or twangy. In between, you get a gentle transition of tone without ever losing any power or delivery. It really is the most balanced sounding of any single-pickup passive bass. Although all Precisions look and sound fantastic, to these eyes, this early 60s model was always far more refined in looks, feel and overall sound - no wonder it became the firm favourite of many players for stage and studio alike. In all honesty, nothing has changed here, because attention to period detail and feel is what the American Vintage series is all about. As history reveals, the Precision is man enough and subtle enough for all genres from smooth jazz to death metal, and although it lacks the ability to get those funky hollow sounds associated with the two-pickup Fender Jazz, it still sounds soulful in the hands of the right player. Within this new American Vintage series you can also experience the nostalgic looking 1958 model with its slightly brighter sound - another beauty.